While Apple was not the first to develop and implement pointing devices within the personal computing environment, they were certainly the company that brought the technology to its fruition. First introducing the mouse pointing device within the Lisa platform, Apple would refine the devices themselves and the graphical user interface which supported the mouse, within the Macintosh platform circa 1984. Over time, it became clear that the over usage of a mouse could contribute to a Repetitive Strain Injury. Many companies developed different solutions to combat this problem. As a graphic designer in the late 80’s, I was forced to look for an alternative to the standard mouse. Enter the Kensington Turbo Mouse. With the development of the Turbo Mouse, Kensington changed the pointing device ecosystem. Not only did the Turbo Mouse provide a large stationary ball to relieve the stress involved in standard mousing (a verb is born), but they also added additional programable buttons to extend the usability of the Turbo Mouse. I was in mouse heaven. Soon after adding the Turbo Mouse to my workflow, my pain was gone and I was more productive. 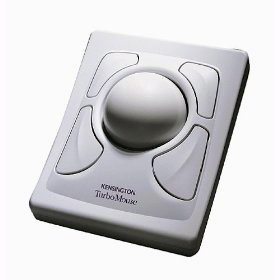 Through the years, Kensington has continued to develop and innovate within the trackball space. While I have not been a fan of every iteration, the products which stayed true to the original design ethos of the Turbo Mouse, have always garnered my attention and admiration. Enter the Expert Mouse. With the introduction of the Expert Mouse, Kensington has added some needed upgrades to the original Turbo Mouse concept while staying true to that original design directive. With such features as Kensington’s DiamondEye Optical Tracking Technology, their award winning Scroll Ring Technology, and the new included wrist rest for additional comfort, the Expert Mouse is an ideal combination of industrial design and precision engineering, form meets function. To me, it is the kind of trackball Apple would design if Steve decided to wade into the trackball waters. Everything you need is included in the box. Just plug the Expert Mouse into your USB port and start enjoying the good life. One of the greatest aspects of the Expert Mouse is the MouseWorks software which allows one to program the buttons of the Expert Mouse (more on this later). If you have never used one of Kensington’s large ball trackballs, the first thing you notice is how effortless it is to move the cursor. With this type of tracking device, one moves the cursor by using the finger tips instead of grasping the device with the hand. For me, there was no learning curve, only an immediate relief of the stress and pain I had felt when using a standard pointing devices. IT TRACKS LIKE BUDDA! I was particularly interested in Kensington’s DiamondEye Optical Tracking Technology. The only thing I didn’t like about the original Turbo Mouse was the mechanical wheels used to triangulate the position of the ball with the position of the cursor on the screen. Like any other mechanical component, these wheels would eventually wear out. They could also stick and make cursor navigation very difficult. In theory, replacing the mechanical wheels with a light based fully solid state electronic tracking system is ideal, but how would the implementation actually work in the cruel world upon my desktop? In a word (well two words), INSANELY GREAT! The tracking system was both smooth and accurate. The surface on the ball itself created very little to no friction at any contact point. 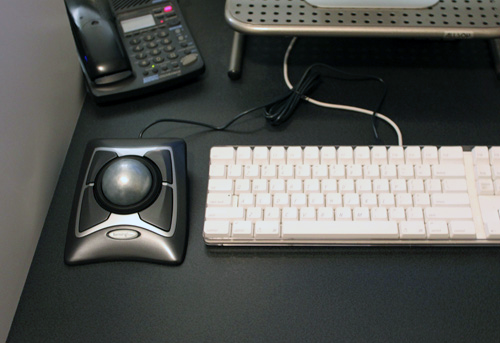 I have to take my hat off to Kensington, this is the smoothest most accurate trackball I have ever used. THE RING IS KING! Another Kensington innovation is the addition of a Scroll Ring to the original Turbo Mouse design. 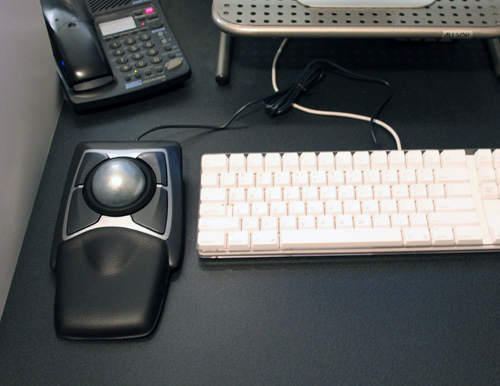 Kensington has places a horizontal ring just outside of the trackball which allows the user to scroll vertically within any scrollable window by turning the ring to the right or left. As a longtime Apple enthusiast, I regularly use Apple’s multi touch trackpads to scroll my pages both vertically and horizontally. At first, I thought the vertical scrolling limitation would be cumbersome and too limiting. After using the scroll ring for a few weeks, I found it to be very useful and a great addition to the Expert Mouse. I would like to see the next iteration reduce the level of friction within the Scroll Ring system. I found it to be a little excessive and counterproductive at times. BUTTONS, BUTTONS, BUTTONS! The Expert Mouse, like its predecessors, employs four buttons arranged around the trackball to allow the user, when combined with the MouseWorks software, the greatest (IMO) flexibility within a pointing device. One can program all four buttons to click, right-click, drag, launch applications, as well as a host of other options. The Expert Mouse really is a productivity tool of the highest order. I was somewhat bothered by the tactile response of the buttons. Once and a while, a button would make a strange noise as if something within the button assembly was rubbing or being obstructed in some way. It is possible that this was a fluke. I have not noticed the sound or response for some time now. Maybe it was simply that the Expert Mouse needed to be broken in. THE SUM OF ITS PARTS! 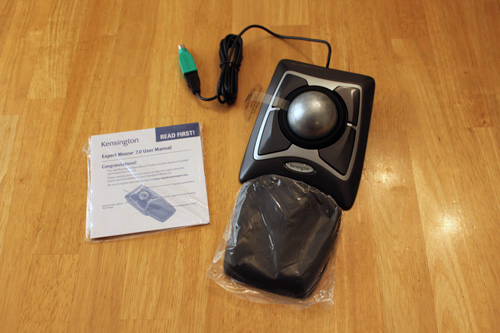 With a few slight improvements not withstanding, this is indeed the best trackball Kensington has ever made, and the best version of this trackball I have ever used. It is smooth, accurate, highly programmable, and non-injurious. As stated above, I would like to see Kensington reduce the friction of the Scroll Ring and take a look at the button assembly to ensure a consistent response and feel. However, sans these minor issues, it is hard to find fault with this product. The Kensington Expert Mouse is a professional pointing device worthy of its price point in the market place. When one considers the quality of technology and components within this product, the price point becomes reasonable if not approaching a good value. There is room for improvement, as noted above. 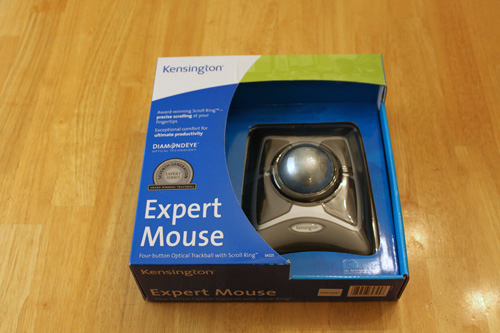 Therefore, I am awarding the Kensington Expert Mouse an outstanding rating of 9 out of 10 in our MyMac.com Rating System.